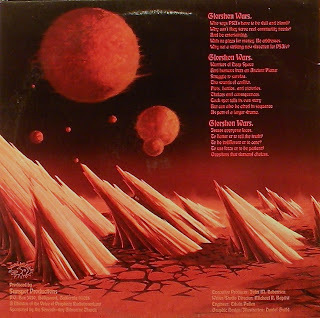 Glorshon Wars – that sounds like something that might come out of L. Ron Hubbard’s brain. As it turns out, it’s some creative Seventh Day Adventist joes trying to provide an alternative to the usual dull radio spots. Biblical stories of the fall of Satan, the fall of man, the death and resurrection of Christ and end-times conflicts are all presented in an allegorical sci-fi drama over the span of thirty short public service announcements. Kind of like The Chronicles Of Narnia meets Battlestar Gallactica. Bold orchestral music opens each segment, followed by a deep voice proclaiming “Beyond the boundaries of deep space, before the beginning of time, there was a war…”. The drama then unfolds in first-person dialogue as Dobrag rebels against the King, the evil unicorn persuades Lady Glissna to drink from the magical river, Prince Mylor (Commander of Glorshon) comes to exchange his life for the captives of the Planet Klag, the unicorn drives his horn through Mylor’s heart, Mylor’s body disappears, etc. (I’m guessing on the spellings of the names here). Pretty wild stuff, with cool sci-fi cover art front and back. Same folks that did the equally intriguing Bright Spots collection. (The Archivist by Ken Scott, 4th Edition). In this blog there are some good Christian rock albums, courtesy of Mr. Galacticgarden. Had this disc in my basement for many, many years. I think I finally pitched it 3 years ago when scaling down to move to a condo. Funny to see it again!